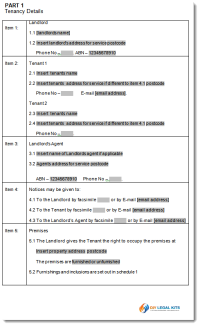 Whenever a landlord grants a right of occupation of residential premises, or part of premises (including any land occupied with the premises) to another person for the purpose of use as a residence. A solid real estate lease can protect your investment by defining your relationship with your tenants and shielding you from potential liability. In fact, a well-crafted lease should be the foundation for the ongoing relationship between you and your tenant. Our professional lease documents and easy to follow instructions give you the confidence that your interests are protected. 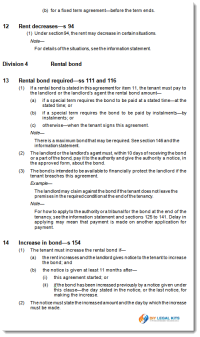 This QLD General Tenancy Agreement has been professionally drafted to conform to the requirements of the Residential Tenancies and Rooming Accommodation Act 2008 (Qld.). Formatted for your convenience using Microsoft Word, it can be downloaded immediately after purchase. This Queensland Tenancy Kit includes an instructional video that walks you through the process of completing your agreement. It can be viewed in the Members Area after purchase. 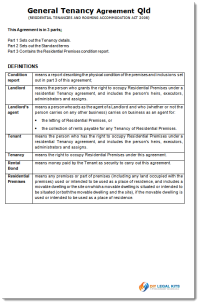 Your ready-to-use Queensland Basic Residential Tenancy Agreement provides the documents you need to get your tenancy under way. Our fully secured ecommerce system allows you to purchase and download your Qld Residential Tenancy Rental Agreement Package safely. In just a few minutes you can have everything you need to rent your Victorian property.